Mars Pathfinder was the first spacecraft to land on the red planet since the two Viking landers in 1976. It was launched on December 4, 1996, and reached Mars on July 4, 1997. The spacecraft entered the planet's thin atmosphere, was slowed by a parachute and then rockets, and landed by bouncing on inflated airbags. Its protective aeroshell then unfolded to provide three flat platforms, one of which held the Sojourner rover. 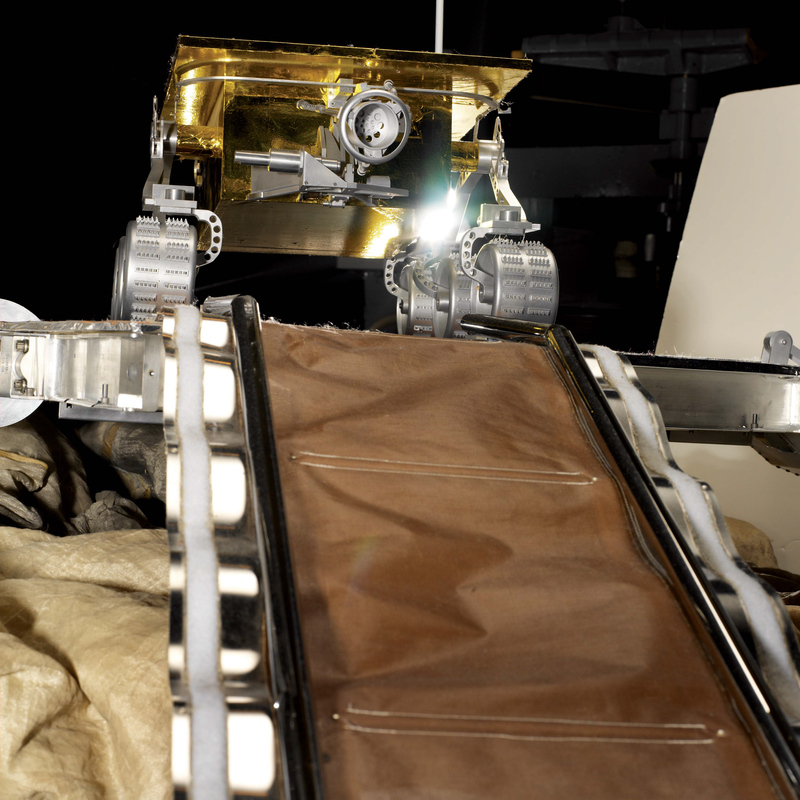 Sojourner traveled down a ramp, studied composition with an X-ray spectrometer. Mars Pathfinder Lander Prototype on display at the Udvar-Hazy Center. 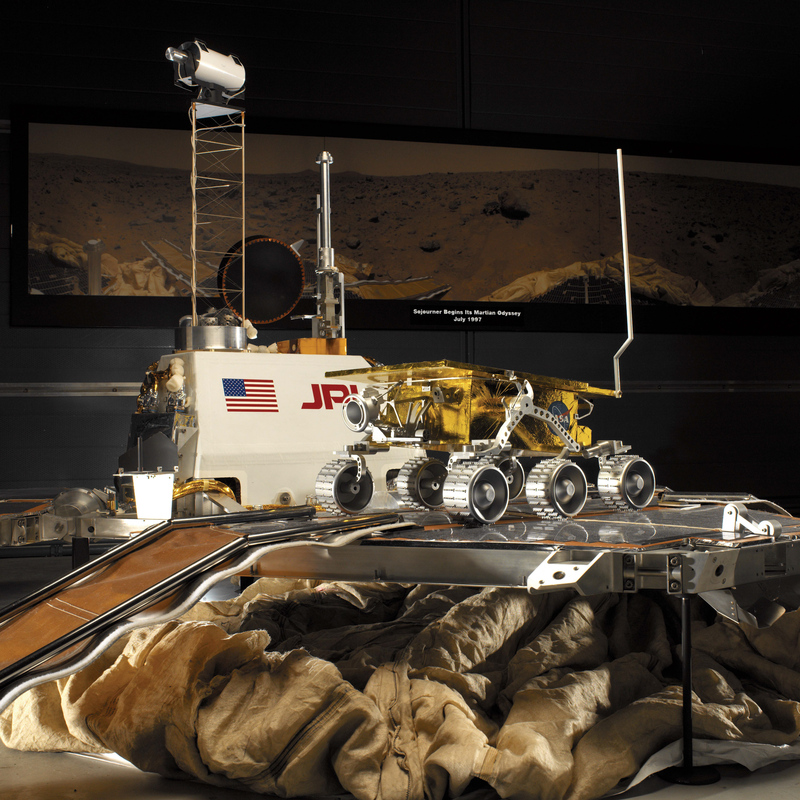 Sojourner, the first rover NASA successfully landed on Mars, was not only a mission success, but it also helped to excite the public about planetary exploration. Mars Pathfinder was the first spacecraft to land on the surface of the red planet since the Viking mission in 1976. The artifact is a full-scale engineering prototype for a spacecraft that was launched on December 4, 1996. On reaching Mars on July 4, 1997, the spacecraft entered the planet's thin atmosphere, was slowed by a parachute and then rockets, and then landed by bouncing on inflated airbags. The protective aeroshell then unfolded to provide the three flat platforms, one of which held a rover (Sojourner). Pathfinder had a TV camera and scientific instruments to gather scientific data on the martian atmosphere and weather, as well as solar cells to provide power and communications. The lander operated for over 90 days, during which it relayed 2.3 gigabits of data including that gathered by Sojourner. Some of this data suggest the presence of large amounts of water on Mars in the distant past. The spacecraft as well as the prototype were designed and built by JPL for NASA's office of Space Science. This engineering model was transferred to NASM by NASA in 1999. “[It was a] rock festival on Mars. "— L. Jaroff, TIME, July 21, 1997. In August 1996 a team of NASA and Stanford University scientists announced that a Mars meteorite found in Antarctica contained possible evidence of ancient Martian life. Scientists hypothesized that the 4.2-pound, ­potato-­sized rock (identified as ALH84001) formed as an igneous rock about 4.5 billion years ago, when Mars was much warmer and probably possessed oceans hospitable to life. Then, about 15 million years ago, a large asteroid hit the red planet and jettisoned the rock into space, where it remained until crashing into Antarctica around 11,000 b.c. According to some experts, ALH84001 appeared to contain ­fossil-­like remains of Martian microorganisms 3.6 billion years old. The findings electrified the scientific world and excited the public, boosting support for an aggressive set of missions to Mars to investigate these tantalizing possibilities. By chance, Mars Pathfinder stood ready¾the first mission to the red planet since Viking twenty years before. Underway at the time of the ALH84001 discovery, Pathfinder became an urgent priority for NASA. Launched in December 1996, the probe successfully landed on Mars on 4 July 1997. Nearly everything about Pathfinder generated excitement. It exemplified a new NASA spacecraft philosophy of “cheaper, better, faster” and featured two noteworthy innovations. As the craft descended through the Martian atmosphere, it did not use retro-rockets¾rather air bags inflated, allowing the probe to bounce along the surface until coming to rest. As the airbags deflated, three solar panels unfolded, revealing the probe’s most innovative component¾a small, 23-pound solar-powered robotic rover, named Sojourner. The solar panels, positioned close to the surface, provided a ramp for Sojourner to venture onto Mars. It proceeded to take close up images of the surface using two color cameras on the front and a black and white camera on the rear. The rover also contained a rear-mounted Alpha Proto X-ray Spectrometer that provided bulk elemental composition data on surface soils and rocks. In addition, the stubby wheels of the rover provided information about the physical characteristics of the surface soil and rocks. It discovered important new data about rocks washed down into the Ares Vallis flood plain, an ancient outflow channel in Mars’ northern hemi­sphere. Projected to operate for 30 days, the rover worked for nearly three months,capturing far more data on the atmo­sphere, weather, and geology of Mars than scientists expected. NASA lost communications with Pathfinder on 27 September 1997. In all, the Pathfinder mission returned more than 1.2 gigabits (1.2 billion bits) of data and over 10,000 pictures of the Martian landscape. While this scientific harvest did not answer the questions posed by ALH84001, it did deeply enrich our understanding of the planet. The mission caught the imagination of the public¾especially the activities of the plucky Sojourner rover. Its ­semi-­autonomous “be­hav­iors” made it a favorite of the public, which followed the mission with great interest via the World Wide Web. Twenty Pathfinder “mirror” sites recorded 565 million hits worldwide during the period of 1 July to 4 August 1997. The highest volume of hits in one day occurred on 8 July, when a record 47 million hits ­were logged¾more than twice the volume of hits received on any one day during the 1996 Olympic Games in Atlanta. The lander in the NASM collection is a backup acquired from the Jet Propulsion Laboratory in 2000. The rover is a full-scale model that was built by the Jet Propulsion Laboratory for the National Air and Space Museum. The rocker-bogie, wheels and frame are constructed of aluminum and are similar to the actual flight vehicle. However, the scientific navigation, and communication instruments are made of resin and do not possess all of the detail of the originals. Mars Pathfinder with its rover, Sojourner, was the first spacecraft to land on the surface of the Red Planet after the Viking mission.